A sad-sense of ‘brown eyes crying in the rain‘ this Tuesday morning on California’s north coast, or maybe weeping — juxtaposition-ed between a Low pressure to the north, and a High to the south, we’re really, really getting seriously wet. Supposedly, a mild break maybe starting Thursday, but mostly rain from here to whenever. 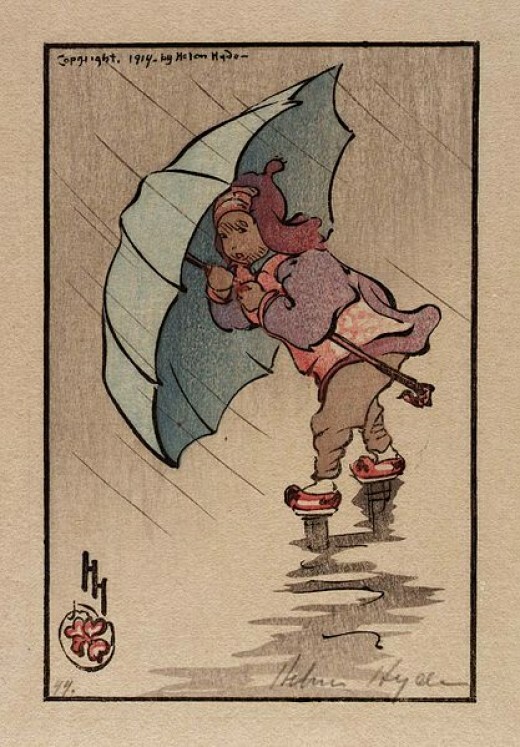 (Illustration: ‘The Blue Umbrella 1914,’ by Helen Hyde, found here). But that rain and snowfall is no end to California’s water woes. In fact, it may just be the beginning. “This has kind of given us a glimpse of what the future might look like,” said Jeffrey Mount, a senior fellow at the Public Policy Institute of California’s Water Policy Center and a water expert at the University of California, Davis. Heat is a powerful force, rain or shine. “While more and more people understand that humans are changing the climate, most only know that the planet is warming up,” Peter Gleick, president emeritus and chief scientist of the Pacific Institute, said. “We’re already in a place that has wet wets and dry dries, but those differences are supposed to become even greater over time” as global temperatures rise, Mount explained. The future will leave California with even “wetter wets and drier dries,” like those of the past seven years, he said, noting that temperatures were extremely high during the drought and are still slightly above average during this wet winter. And a common refrain nowadays: ‘“We are long past the point where we should be planning — and acting — to adapt to now unpreventable climate changes,” Gleick said.